Let’s hope this is a sign of things to come. Bright sunshine, a welcoming crowd and a seven-goal thriller. What’s not to like about this groundhopping lark? 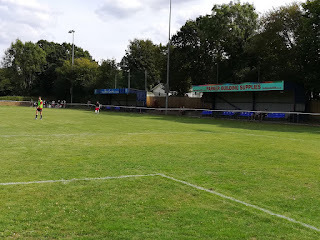 I arrived at The Oaks for the match between AFC Uckfield and Horsham YMCA ten minutes before kick-off, having been dropped off by my Mum (it’s just like being a teenager again). It turns out that, despite having never been to the ground before, I must have driven past it on numerous occasions and never even realised it was there. Tucked off the Eastbourne Road, next to a holiday home park on one side and an Indian restaurant on the other, it really is a case of blink and you’ll miss it. It also turns out that it’s located about a five-minute drive from my mum’s house (hence the lift); making the fact that I’ve never visited before even more shameful. The ground itself is surrounded by trees (hence the ground’s name – The Oaks – I guess) with two covered seating areas running up one touchline. The clubhouse is sizable, but located outside the ground itself, so worth going for your pre-match drink before paying your £6 entrance fee (cheaper for children and adults of the older variety). Otherwise you risk entering only to exit again – as I did. 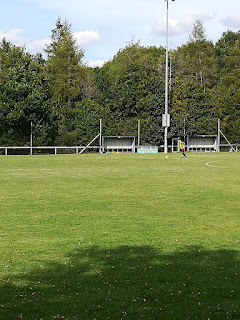 Well, I am only a novice when it comes to these groundhopping shenanigans. The game itself, as the 4-3 scoreline suggests, was highly entertaining. A mixture of good play, shambolic defending, questionable penalty decisions (looked a dive from where I was standing) and a slice of luck all contributing to produce a thriller. It’s fair to say the game featured one of the best worst passes that I’ve ever seen. An Uckfield player completely shanked his pass, and even apologised to a teammate for the mishit, only for unintended recipient Bailo Camara to run onto it, keep the ball in play, then squeeze his shot past the keeper. What an assist. Non-league football at its finest. Horsham, in my opinion were worthy winners. One of the Division’s title favourites, they play some good football, and have a number of good players going forward. They hit the woodwork (metalwork) three times and missed an open goal. They clearly had a plan to exploit the Uckfield right back who they managed to get in behind time and time again, and their first two goals came from crosses from that flank. Uckfield, for their part were very robust and never gave in. There will be very few teams that take points away from them this season without a fight. Having said that, having scored three goals and fought back into the game twice after falling behind on two separate occasions in the second-half, they will be disappointed not to have got at least a point. So, all in all, a thoroughly enjoyable afternoon, with only one minor gripe. Maybe invest in some more balls, as the amount of time lost to retrieving balls as they were fired into the trees, over stands, and even onto the clubhouse roof, was quite substantial. That said, it was a very hot day, and the players all needed regular drink breaks, so maybe it was a tactic.